While the phones in our pockets may be perfect for taking photos of our pets, taking good images of catalysts and other materials is far more complex, especially when you bring in scanning transmission electron microscopy (STEM). The STEM imaging method is a way to observe catalysts while they're working, or under catalytic conditions. The challenge is that background scattering from reaction gases, chemical reactions that produce gases, involved lowers the image quality, obscuring vital details about the structure and chemical composition. Dr. Yuanyuan Zhu and Dr. Nigel D. Browning, Pacific Northwest National Laboratory, demonstrated how to effectively image catalysts within the STEM method. Catalysts are vital to reactions involved in everything from the plastic casing around your phone to the fuel in your car. Creating faster, more efficient catalysts to reduce costs and wastes requires clear and detailed observations of catalysts when reaction gases are introduced to STEM imaging. The new method provides a roadmap for scientists to reduce background diffraction from reaction gases. Transmission electron microscopy is a projection technique in which a beam of electrons is transmitted through a sample and forms an image. The resulting image can then be focused onto an imaging device and analyzed. "The idea is that you can actually see how a catalyst would function by viewing it on the atomic scale," says Browning, catalysis scientist. Zhu and Browning created an in situenvironment in the imaging chamber, meaning that the materials are located within the chamber. They then pumped different reaction gases into the chamber at different pressures to measure the amount of background scattering that occurred in each image. The result was a detailed blueprint of how to subtract the diffraction of the gases to create clear and detailed images that are ready for interpretation. "This is a method that can be very widely applied to catalysis observations," says Browning. "We've gone through a detailed characterization of how to do that so that anyone else who wants to do these types of experiments can do the same thing and get very detailed [images]." 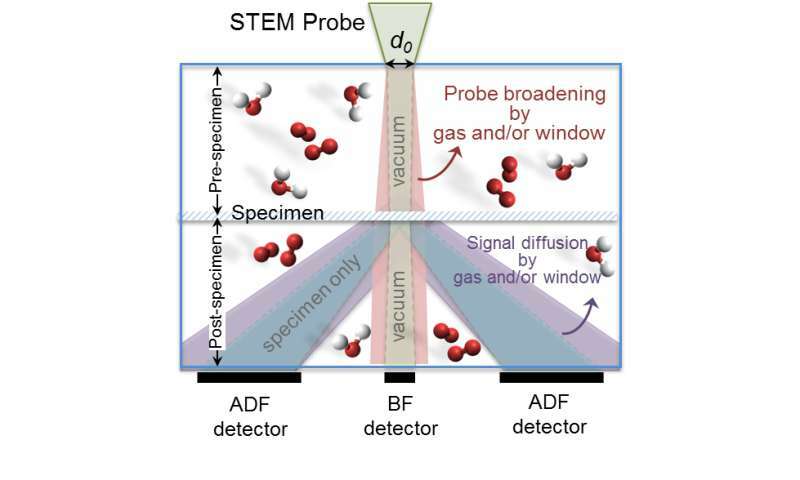 The next step for Zhu and Browning is to investigate the gas pressure diffraction on different catalysts.